More Taylored Expressions Cards using the October New Release! Sharing with you some more Taylored Expressions cards using the October new release. Make yourself a cuppa of coffee and enjoy! 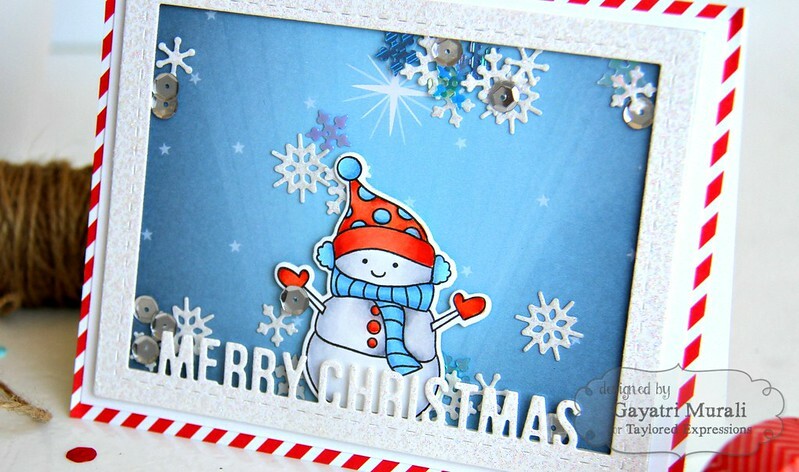 This is my first card using Baby, It’s Cold Outside stamp set and coordinating dies. The images in this set are adorable and perfect to unleash your colouring skills. I started with stamping the colouring the images with copics and then diecutting them out. On the card front, I sponged some Tumbled Glass and Salty Ocean distress inks. Then I die cut a circle out of Stitched Circle Stack on a white cardstock panel trimmed to the size of the card front. I will use the stitched circle die cut for another card but for this card, I am using the negative panel. 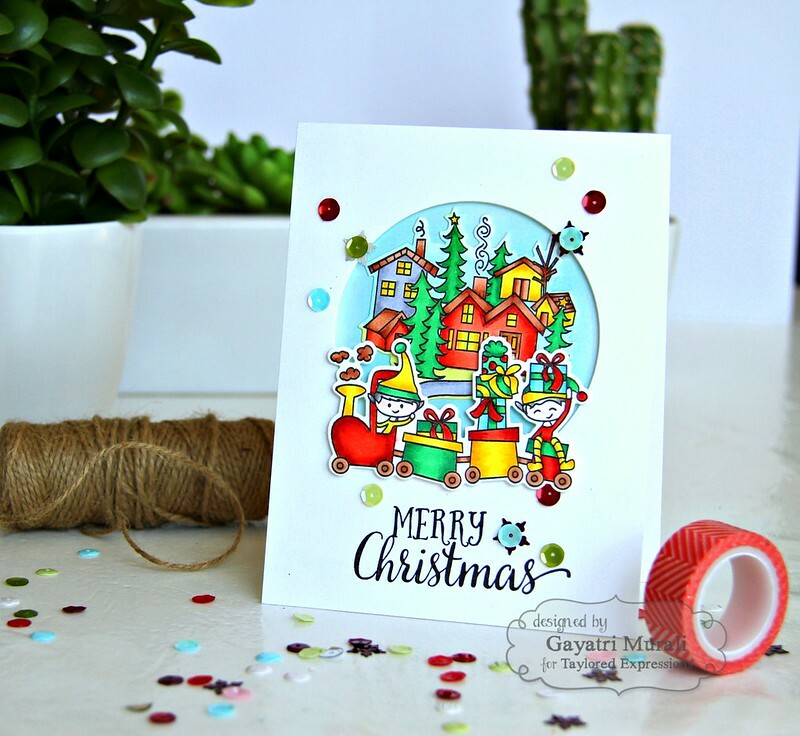 I stamped the sentiment from In & Out Christmas below the circle die cut in black ink. Then I mounted this panel on the card front using Foam adhesive. I love the window with the blue background. I adhered the house die cut image flush inside the circle. And the elf on the toy train using foam below. I embellished with Build A Scene: Christmas sequins. Here is a closeup of the card. Next up is a shaker card. 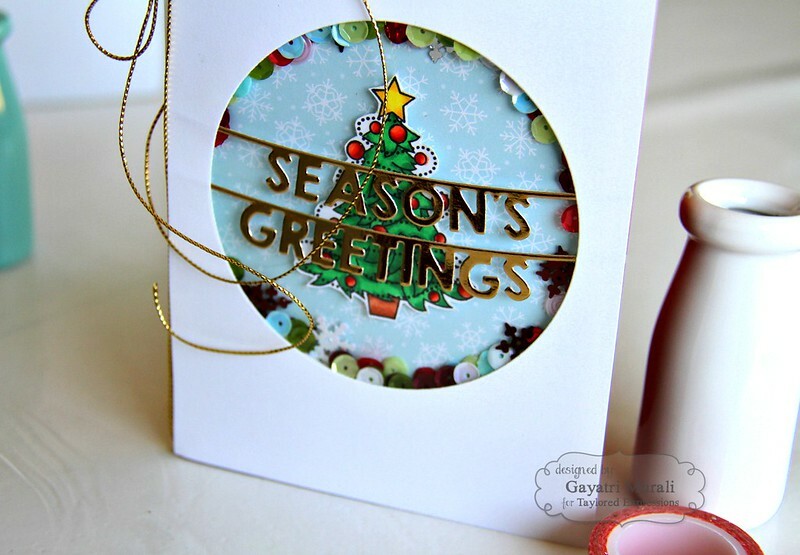 I love this card very much because of the colours and easy to make using the new Picture Perfect Dies. The Picture Perfect die sets come in either vertical or horizontal orientation and in two sizes in each set. These are so versatile. On my card here, I have used the horizontal large die. I die cut using white glitter paper. 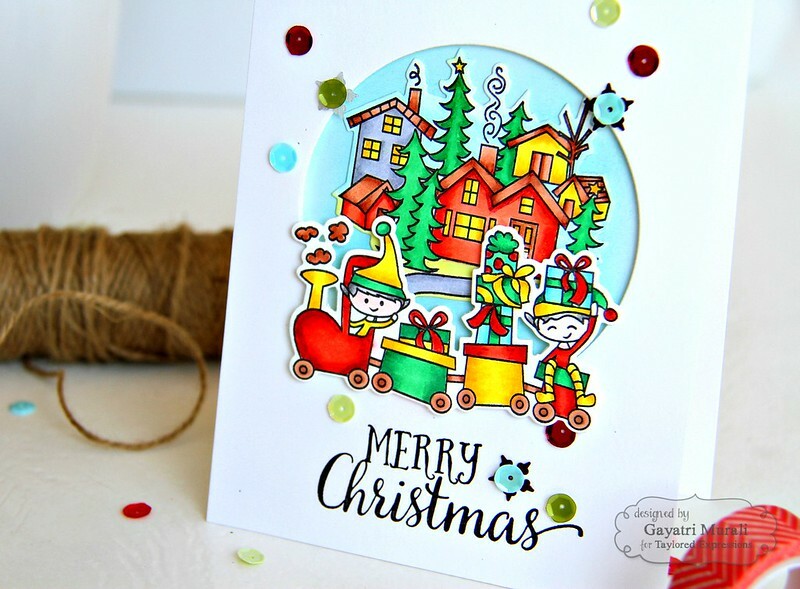 The background is pattern paper from Build a Scene Christmas 6×6 pattern paper from Taylored Expressions. I trimmed the paper to size. The snowman is from Baby, Its Cold Outside. I stamped, coloured and die cut using the coordinating die. Then adhered the image on the pattern paper, added some snowflakes and sequins from Build a Scene Christmas sequins. To add more snowflakes, I die cut Little Bits Snowflakes die using white glitter paper. I made a shaker box by adhering foam adhesives on the Picture Perfect die cut to the preped pattern paper and snowflakes. I matted the shaker box on a white cardstock and again on the red striped pattern paper from Build A Scene Christmas 6×6 pattern papers. This entire panel on to a white card front. That is it! Simple and easy to make and so much fun. Here is a closeup. 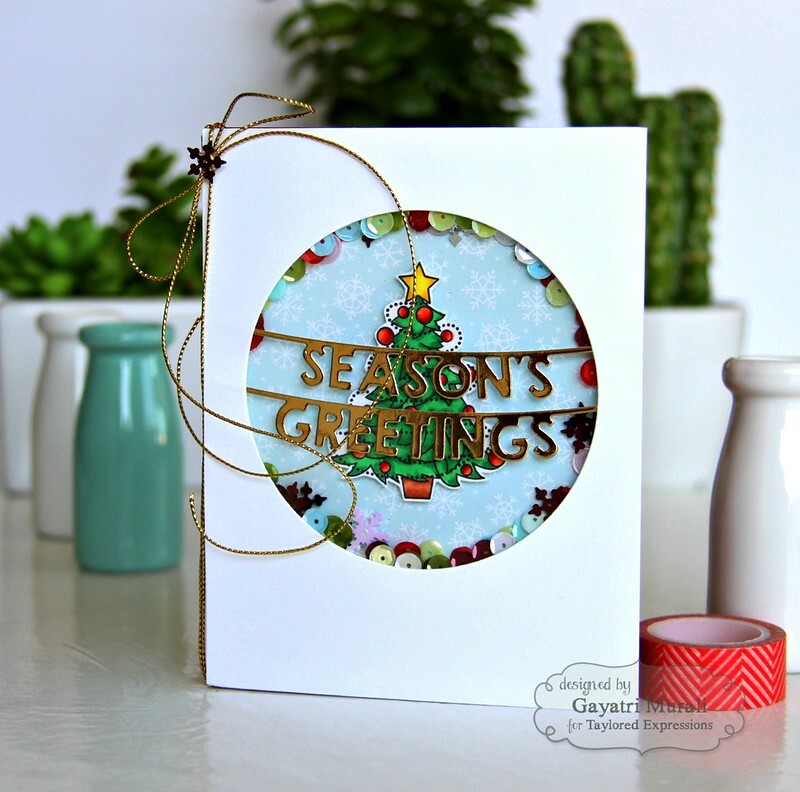 The third card is another shaker card using Season’s Greetings Banner die. Again to have used the tree image from Baby, It’s Cold Outside which I stamped, coloured and hand cut out. 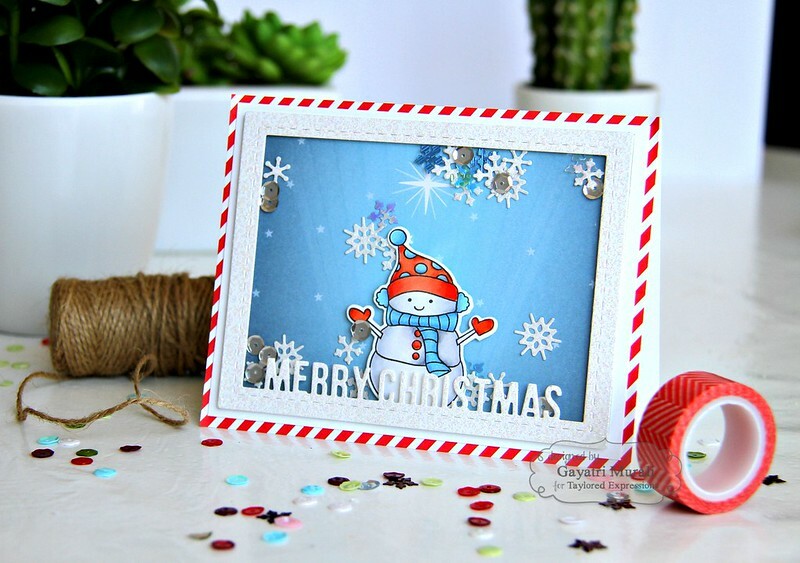 The background for the shaker card is pattern paper from Build a Scene Christmas 6×6 paper papers. I adhered the tree to the center, The sentiment is Season’s Greeting Banner die die cut after gold foiling a laser printed cardstock completely black. I adhered this banner to the negative of a circle die cut panel, behind an acetate sheet, filled the shaker box with sequins from Build a Scene Christmas sequins. To coordinate the gold sentiment, I used gold twine on the fold with a big bow and snowflake sequins in the centre of the bow. Here is a closeup! Hope you love my projects using the new released goodies from Taylored Expressions. For more inspirations, check out Taylored Expressions Gallery. I have listed all the products, I used on my projects below for your convenience. All the cards are so beautiful.. loved the second one alot.. I really want to make Christmas cards but I have no one to gift it to.. :(.. hey looking forward to your Diwali cards !!! I love the cards but I really love all the work you do. I love all the colors that you use and all the detail you put into them. The one scene card must have taken forever to do and it is a true work of art! Beautiful cards!! Love the shaker cards! !